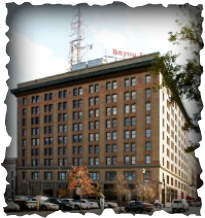 Bayou Lofts is located in the Historic District of downtown Houston and was originally built in 1910. It was the headquarters for the Southern Pacific Railroad for 85 years and converted into lofts in the 1990's. It is 9 stories high, with 108 units and 14 Penthouses. Amenities include: Concierge | Fitness Center | Rooftop | Terrace and Pool | Party Room | Drycleaning Pickup | Storage Space | Attached Garage with Assigned Parking | Controlled Access | Service Elevator.